By Karrar Haider in Internet. Updated on December 8, 2017 . I have always been a big fan of online shopping as it allows me to buy just about anything from anywhere in the world without having to leave the comfort of my home. However, while shopping online I used to miss the aspect of bargaining and choosing the best deals – which are two of the most important things in a good shopping experience for me. Well, my worries are pretty much over as I find out about a whole bunch of coupon websites that offer best shopping deals and bargains for online shopping. You can find great deals on your favorite items and get opportunities to grab limited time offers. Let’s check out the list of 30+ best shopping deals websites that I’ve prepared for you, so you too can enjoy a complete online shopping experience. 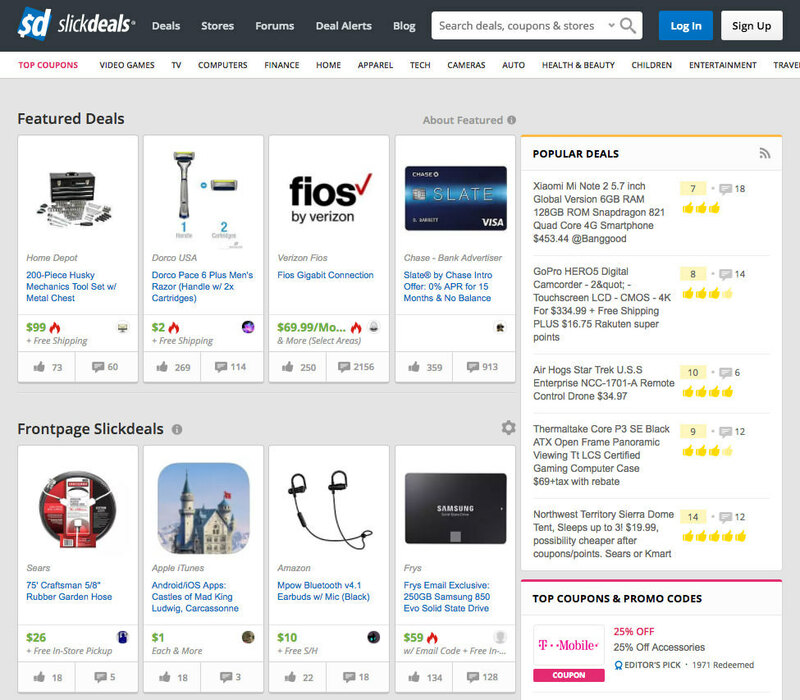 SlickDeals is one of the biggest community-driven shopping deals site that offers a huge range of active deals. All the offers are added by the huge community of SlickDeals and then voted to reach the front page of the website. The best ones are hand-picked by editors to be "Featured" and rest stay on its first page. Most of the deals here are related to electronics and software subscriptions. Although you may also find deals on home products, beauty products, kitchenware and more. You may even find free products such as free samples, subscriptions and limited time free premium plans, and there are comments on each deal to see what the buyers reviews. Good for finding deals on tech-related items. One of the oldest shopping deals website, DealNews is run by multiple experts who are very serious about finding the best deal for you. Every day editors find the best deals from over 6000 retail stores with the focus on finding the cheapest ones. They promise to find only the cheapest deals without focusing on advertising, and I must say, they do a great job of keeping this promise. I really like their deal listing format that shows all the details about deals on the same page. This definitely saves your time as you won’t have to click on a deal only to find out that you are not eligible for it. DealNews lists a good balance of tech and clothing deals, and you may also find good offers on home products. Deals are selected by experts. Features best deals from over 6000 stores. 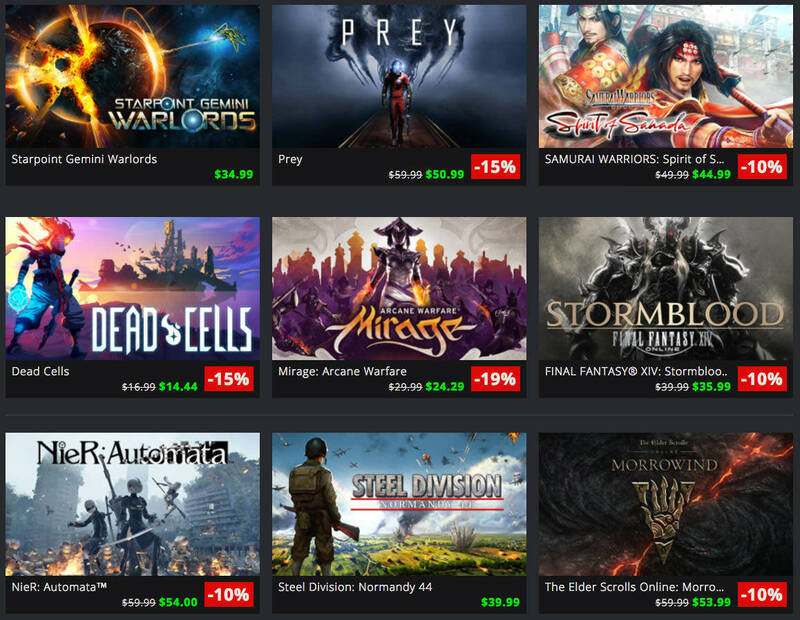 It is the hub for all the gamers to find great deals on videos games. They work with over 500 developers to bring the best deals to you, including Nintendo, Steam, Rockstar, and Uplay, etc. There is a listing of currently trending titles and those that are coming soon. You can filter offers based on consoles and find deals based on popularity. Resident Evil 7, WWE 2K17, For Honor, Dishonored 2 and The Elder Scrolls Online are just a few of the titles currently on sale. You can find deals on both full games and in-game items. Find awesome deals on video games. 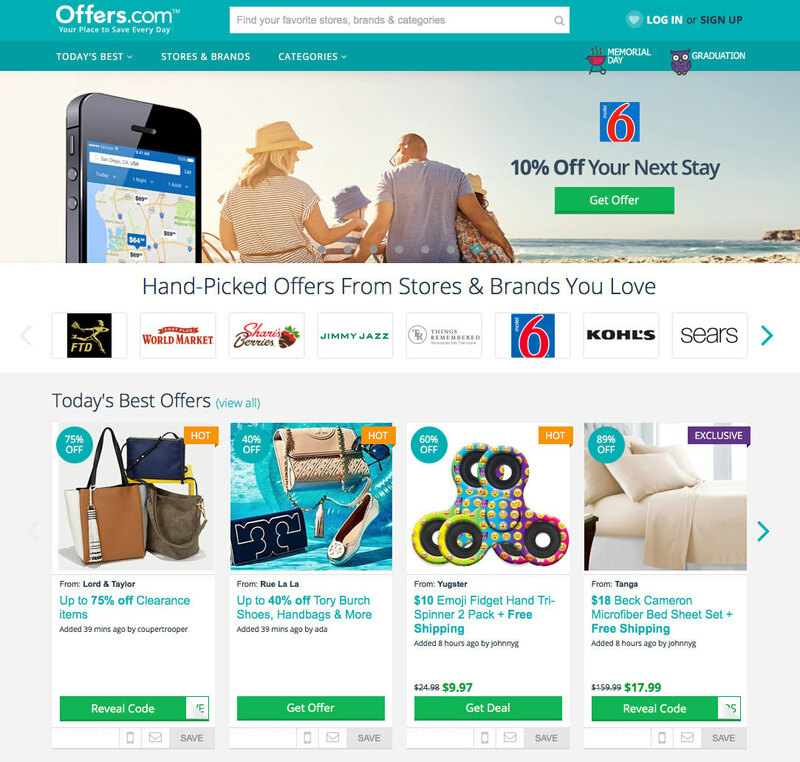 Offers creates a great balance between online deals and coupons. You can find hundreds of great deals and coupons that are usually related to clothing and food items near your locale. You can check out the staff pick section to find every day’s best offers for trending stuff. They also have a very interesting "Free" section where you can find items or services available for free. You can find free food samples near your location, premium software, electronics and items that come free with a specific purchases. Although, Offers usually focuses on food and clothing, but you can also find deals on electronics, software, home products, travel and automotive. Get great deals on clothing and food in your area. A section for reliable free deals. Similar to other websites in this list, Bizrate shows handy weekly deals and promotions on its main page that you will surely love. However, this is not what Bizrate is known for. It is actually a deal finding tool that lets you look for the best deal on your favourite product. 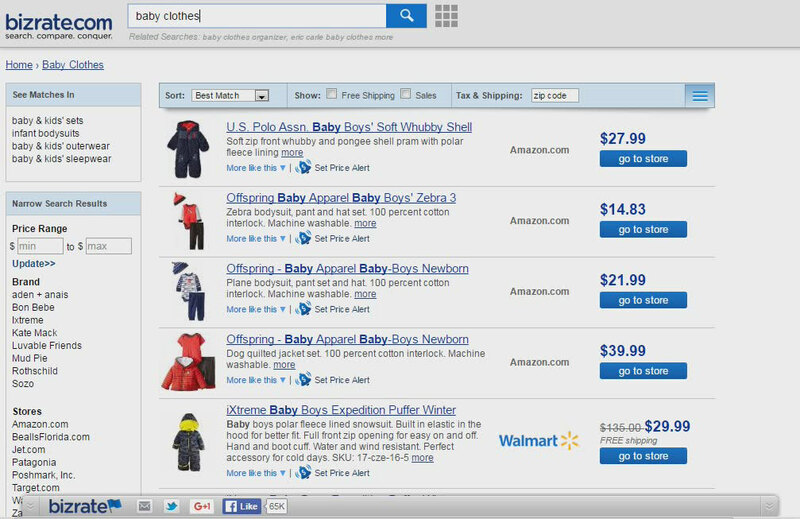 You can search for what you want in the search bar above and it will show results from all the popular online stores in one place. You will find a robust filtering system on the left side to filter results by price, seller or brand. Interestingly, Bizrate automatically finds common features of the product you are looking for and lets you search for the product based on specific features. Search for best deals on different stores. With a focus on everything tech, Yugster offers dirt cheap deals that usually don’t last for too long. There aren’t huge lists, you simply see a single best deal based on your selection, and have a limited time to grab it. For example, you can check out today’s best deal, best tech deal, special deal or even a random deal. You won’t see many results, but the one you will, would be definitely pleasing. You can also navigate through staff picks to find great deals if the everyday recommendation isn’t enough for you. I also found many great free deals that are worth checking out. Find deals on tech stuff. Cheapest deals of the day. Focus on quality deals more than quantity. 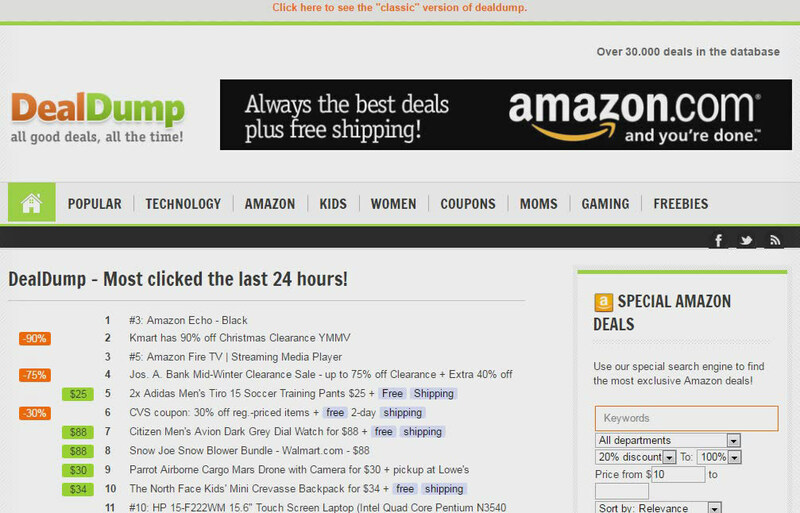 DealDump basically gathers best deals from top shopping deals websites and shows them in an easy to gulp interface. Though, you can simply go to the official site to get the deals, but what DealDump offers are multiple ways to quickly find the right deal. On top, it shows a list of deals that were clicked the most in the last 24 hours. This section will make it easier to see which deals are most popular among the best shopping deals websites. 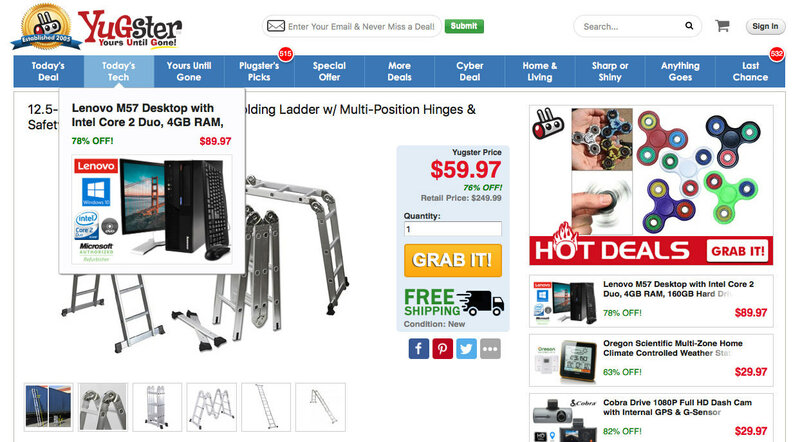 Some of the shopping deals websites include Slickdeals, Dealnews, Amazon, fat wallet, TechBargains, Newegg and more. You can also use keywords, categories, price and total discount percentage on items to search for the best deal. Get deals from multiple shopping deals websites in one place. Multiple ways to find the best deals. 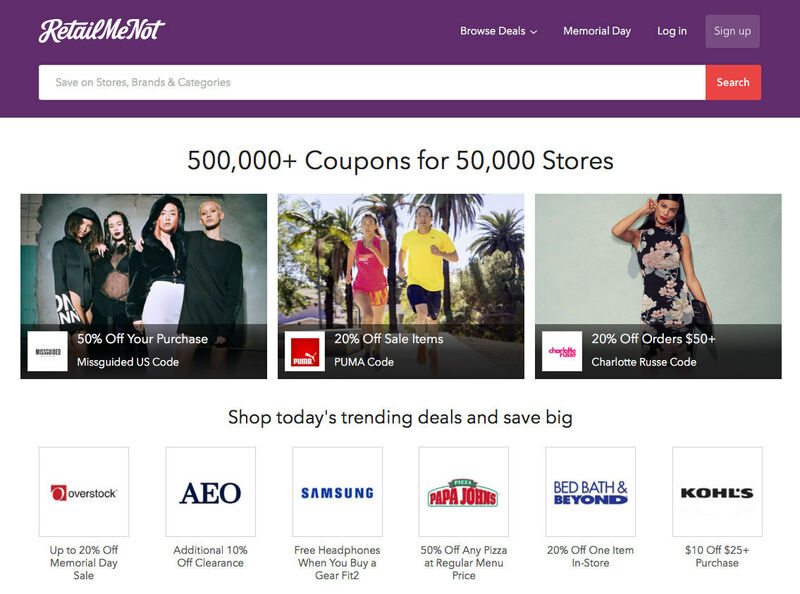 RetailMeNot has one of the biggest and most updated database of coupons that will help you save big on your favourite stores. 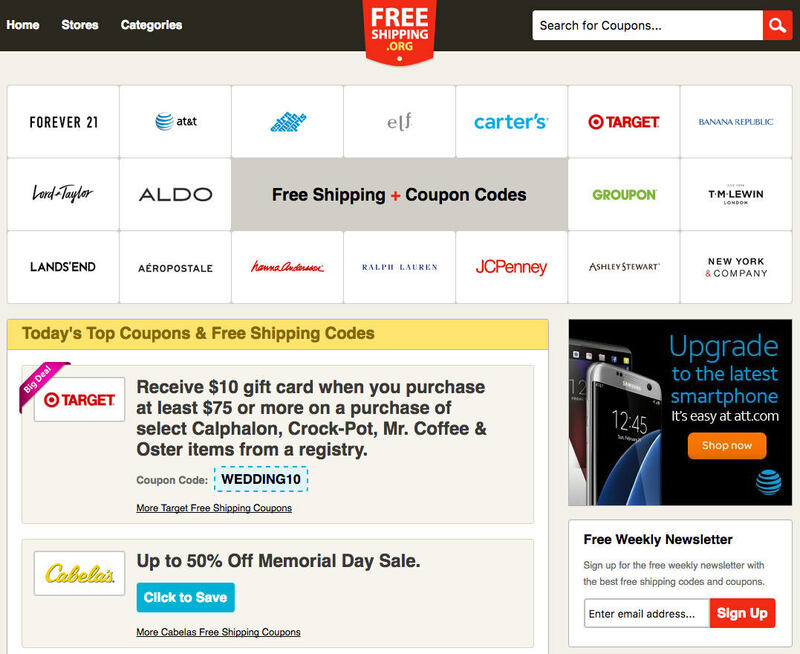 It has coupons from over 50,000 popular online stores that are updated on daily bases. 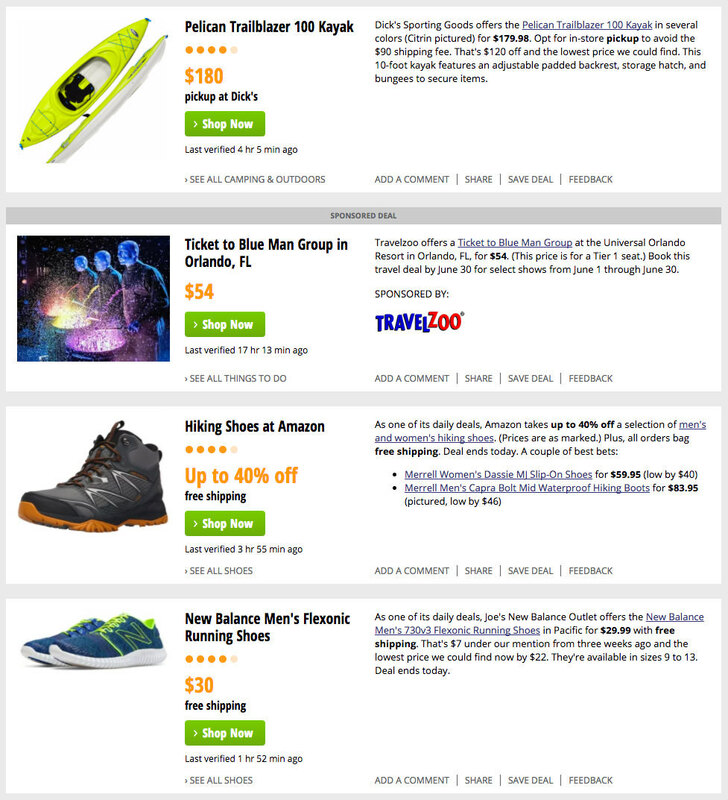 On the homepage, you can see daily best deals and top trending deals. Most of the deals will require you to provide a special coupon code, but some may have different requirements as well. The best way to find good deals here is to enter the name of your favourite store in the search bar and RetailMeNot will show coupons available for it. Many of the coupons offer flat discounts on any purchase, so going through RetailMeNot before making a purchase is a good way to save money. Find coupons for 50000 online stores. 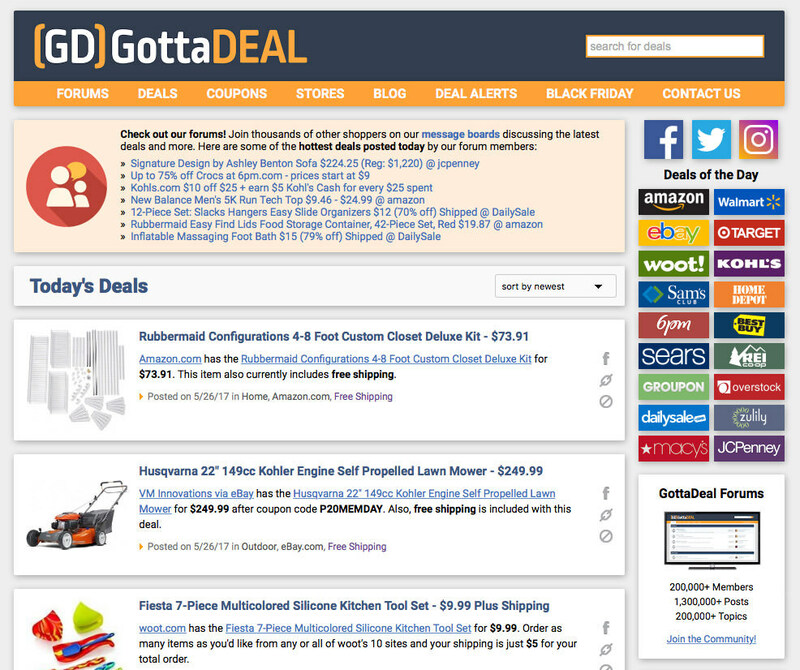 GottaDeal is another popular community driven website like SlickDeals that has many gems worth checking out. All of the deals here are added and voted by forum members to get on the first page. The editors also pick the best deals for you. You can join GottaDeal forums to vote or add best deals you find online. In my experience, most of the deals were related to home products, clothing, accessories, and kitchenware. However, you many also get your hands on some good tech deals if you are lucky. Another website for finding coupons, but as the name suggests its focus is on finding the best free shipping deals and coupons. It has support for thousands of stores, and you can navigate through them to find coupons and free shipping deals for your favourite stores. You can find multiple types of free shipping coupons, such as free shipping to specific locations, free shipping on all orders, free return shipping or free shipping on specific items. I really liked how they keep the coupon codes revealed while you navigate through offers. On other websites, you need to click on the "Reveal" button to see the coupon before using. You can find different kinds of free shipping offers. Which websites do you like for finding the best shopping deals? Do share with us in the comments.